I attended the University of California at Davis (UCD) from 1975 to 1979 as an Animal Physiology major, with a keen interest in Exercise Physiology, and was also a collegiate distance runner for my four years at UCD. Toward the end of my second season on the UCD Aggie track team, in May 1977, a number of my teammates from the UCD Aggie cross-country and track teams had discussed all the fun and interesting costumes that runners had worn at the 1977 Bay to Breakers race. We all thought this was very cool and wanted to do something better for the next year’s Bay to Breakers, in May 1978. Some of the Aggies founding members after a 1977 UC Davis intersquad meet. I specifically remember discussing costumes for the Bay to Breakers a few times with Doug Peck, who was one of my teammates that I often trained with. Then, in April 1978, about a month before the 1978 Bay to Breakers race, another teammate of mine, John Leeper, Doug and myself all decided to do a 10-mile run out on the country roads northwest of the UCD campus. During the run, we started talking about the upcoming 1978 Bay to Breakers and how we wanted to have a great costume for upcoming Bay to Breakers race. We not only wanted a great costume, but also wanted to somehow involve more runners in the costume for the race. I very clearly remember Doug, John and I during that run talking about many ideas for costumes for the 1978 Bay to Breakers. By the end of the 10-mile run, the three of us all agreed that our best idea was to somehow tie ourselves together in a string of runners, maybe by tying all of us together with a rope to form a “Running Centipede". I remember Doug being very excited about this idea and he said he would talk to our other distance running teammates about it after our run. About a week or so later, Doug and one of our other teammates, Steve White, announced to us that they were going to have an informal meeting to make a Centipede for the upcoming Bay to Breakers and that any of us long distance runners who wanted to participate in the first ever Bay to Breakers Centipede should show up for its creation at Hickey Gym at UCD. Steve had bought a 50' x 6' roll of black polyethylene sheeting to act as the "body" of the Centipede that would attach all of us together. We laid down the 50' roll of polyethylene sheeting on the floor of Hickey gym and we decided that, for the 13 runners that showed up that day and who had committed to being part of the Centipede, we needed to cut one large "head hole" and two "smaller head holes" for each runner. We immediately proceeded to cut head-holes and arm-holes for the Centipede body on the floor of Hickey Gym. Someone had also brought along a roll of heavy gauge wire to use as Centipede “antennae" which we all bent around our heads so we could each have two antennae sticking out from the top of our heads. We were all given two 2"-diameter white styrofoam balls to use on the ends of our "antennae" to act as our "feelers". I incorporated my antennae and feelers of steel wire and styrofoam balls into a black hat with red-yarn "wig", which I had safety-pinned to the inside of the hat, for use during the race. In the photo below of the very first Centipede in the 1978 Bay to Breakers race, I am shown holding my red-yard hat with “antennae” and “feelers” in the #3 position of the Centipede. 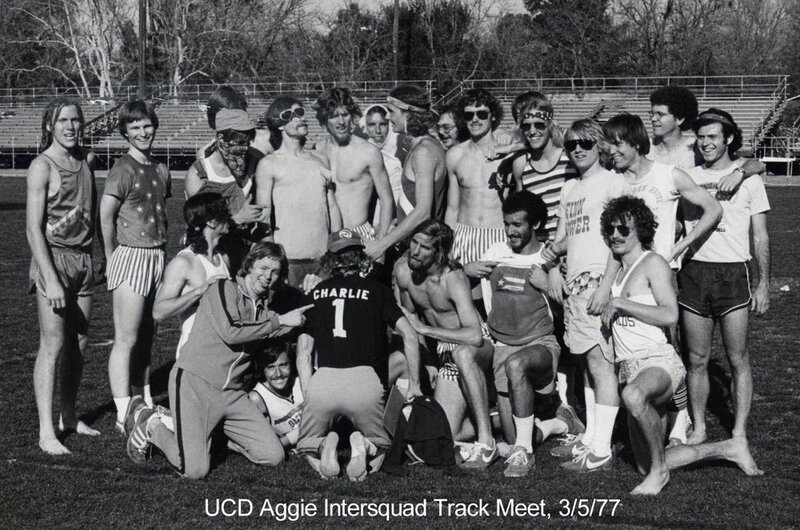 Doug Peck is shown in this photo in the #1 position and Ed Schelegle, who was then a UCD Exercise Physiology graduate student and another UCD Aggie distance runner, claimed the #2 position of the Centipede. We all loaded ourselves into the Centipede in Hickey Gym and then took a test run around the field outside of Hickey Gym to see if this Centipede idea of ours was going to work to run together in. Since each of us were spaced only about 4 feet from each other, we quickly learned, within a few minutes of our first run in the Centipede, that if we wanted to run any faster than a slow jog, then we would need to stagger ourselves to the side of the runner in front of us to avoid being tripped by our fellow Centipedians. A loud call then came out, “stagger!”, from someone in the Centipede. The Centipede then formed into a zig-zag shape, each of us running slightly to the right or left of the runner ahead of us, which easily allowed us to run a 6-minute mile pace during our first "test run" of the Centipede. On the day of May 14, 1978, at the 68th running of the Bay to Breakers, the world’s first Centipede was finally unveiled to the public. We quickly rolled out the Centipede in front of a crowd of other runners about 30 minutes before the race. I clearly remember how other runners and spectators that were in the area had cheered, laughed and made jokes about the Centipede once we had all gotten in our proper positions and donned our antennae and feelers. These people had no idea what this group of crazy UCD distance runners were about to do. They had never seen anything quite like it. It was not only weird, but also crazy and fun. After doing a few warm ups, running in circles, and checking our antennae and feelers in the Centipede, we all decided that we weren't going to be able to run back through the massive crowds to fit behind the starting line in time for the starting gun. We made the decision to start the world’s first ever Centipede from one of the side streets close to the starting line at the 1978 Bay to Breakers race. The gun went off and, after about 500 runners had passed us, all 13 of us in the Centipede flowed into the race as the very first Bay to Breakers Centipede. The call then came up again, “stagger, stagger” from the middle of the Centipede. Once we had properly staggered we were able to get up to about a 6-minute mile pace and started passing runners. All the runners we passed said something like 'What are you guys?!". We would say, "We are a Centipede, of course!" and then pulled ahead of them. We decided, however, during the first few minutes of running in the world’s first Centipede, that we were having too much fun to be running fast. Therefore, Doug and Ed decided the Centipede would run against the flow of the runners, sideways through the pack of runners and zig-zag through the crowd of runners. To say we were all having great fun, was an understatement. It was a blast! That first UCD Aggie Centipede, on May 14, 1978, was the best one of all. We all had so much fun, attracted so much attention and received so much laughter from the other runners in the race that we all knew we had just participated in something very special. The next year, Angel Martinez and Dwayne “Peanut” Harms, both UCD Aggie distance runners, and members of the first Aggie Centipede, challenged the West Valley Track Club to the First Annual World's Centipede championship at the 1979 Bay to Breakers. That year of 1979, the second year of the UCD Aggie Centipede, was when the Aggie Centipede began racing at the Bay to Breakers, with all of us connected together and running at close to race pace. Now, 40 years after our first UCD Aggie Centipede, I still find it hard to believe that this fun-loving group of runners I trained with, raced with and socialized with for so many years at UCD put together the idea to run in the world’ first Centipede which has now become so famous. We had no idea this would happen at the time. I don't believe that any one of us involved in that first 1978 UCD Aggie Centipede thought, when we were creating it, that this Centipede idea would be anything more than a one-time deal of doing something new and different for the upcoming 1978 Bay to Breakers race, and having some fun along the way. Now, 40 years later, these memories are as clear as they happened yesterday. I cherish those days as a UCD Aggie distance runner and being a part of such an interesting, talented and fun group of distance runners during those years. Long live the Aggie Centipede! The 13 Members of the World’s First Centipede in the 68th Annual Bay to Breakers Race, May 14, 1978: Doug Peck, Ed Schelegle, Kevin Kirby, Dirk Rohloff, Dwayne “Peanut” Harms, Angel Martinez, Steve White, Geoff Adams, Pete Sweeney, Rob Anex, Dave Lopez, Mike Pratt and Jay Barrigan.